Asian markets rose on hopes a fresh cash injection by the ECB will help further avert credit crunch and bolster investors’ confidence. Sentiment was also boosted by robust U.S. and German consumer confidence data and falling crude oil prices. Powered by the liquidity inflows particularly into the ASEAN regions, the USD/RM finally breached below the RM3.00 psychological mark to end at 2.993, fueling the KLCI to soar 12.9 pts or 0.83% to 1569.7 (off intraday high: 1573.8). Notable gainers in ASEAN markets were JCI (2.1%), PSEi (1.6%), SET (1.3%) and STI (0.8%). Thanks to the fresh injection of cheap money by the ECB, fresh liquidity inflows are expected to stay firm in the near term, benefitting equities and currencies in the emerging markets. Amid the positive developments and a successful breakout of 15 Feb’s pivot high at 1567 yesterday, a resumption in rally post CNY (albeit intermittent profit taking consolidation) is likely for KLCI to eventually heading towards the 1590-1600 resistances. 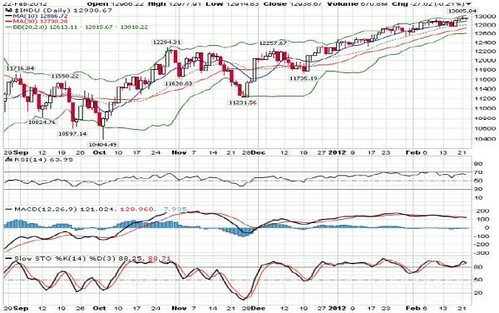 Major supports are 1560 (14-d SMA), 1553 (mid Bollinger band) and 1542 (30-d SMA). Crude oil prices jumped to a 9-month high above US$106/barrel after the International Atomic Energy Agency officials were denied access to an Iranian military base and said negotiations over the country’s nuclear program “couldn’t finalize a way forward.” Earlier, oil prices dipped to US$105/barrel on reports that manufacturing activity slowed in Europe and China, suggesting that fuel demand may decline. Having said that, high crude oil prices are likely to be sustainable in the short term amid escalating tensions between Iran and Western nations coupled with liquidity injection since Dec 11 which spurred big infusion of speculative capital into riskier assets. Iran said earlier this week that it stopped selling crude to France and Britain in a move designed to pre-empt European sanctions. The European Union on 23 Jan agreed to ban crude imports from Iran starting 1 July to pressure the country over its nuclear program. Looking at the chart, if prices can maintain above the long term downtrend line since all time high in June 2008 (US$145/barrel), it may continue to climb towards US$115/barrel after a brief sideways profit taking consolidation. Further resistance is US125/barrel (23.6% FR). 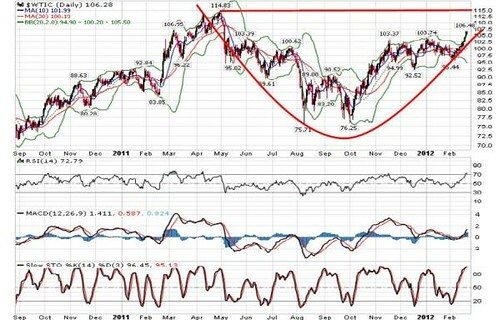 Immediate supports are US$94-100. Sentiment was also dampened by concern of the health of global economic recovery following a report that the euro zone's service sector shrank unexpectedly in February. Adding to market negativity, China's manufacturing sector contracted for the 4th consecutive month in February. Tracking regional markets, KLCI lost 3.3 points to 1560.5, dragged by plantation stocks such as IOICORP (-10 sen to RM5.34), PPB (-50 sen to RM17.14) and KLK (-36 sen to RM23.64) amid a disappointing Wilmar 4Q11 results. Market breadth was negative with 302 gainers as compared to 541 losers. It seems the market is taking a breather and waiting for its next catalyst after the fine run YTD. 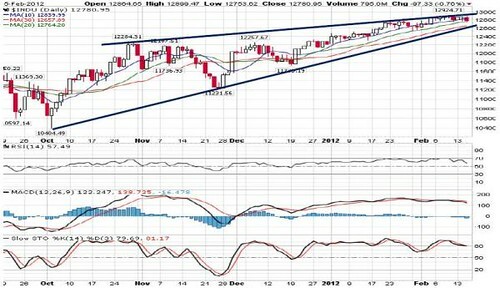 A period of consolidation or even a slight pullback wouldn't be surprising given the overbought market conditions. Overall, the rebound from 16 Feb’s low of 1549 points continues to be weak as broader market turns more cautious and trading volume shrank, suggesting that the rally is running out of steam. 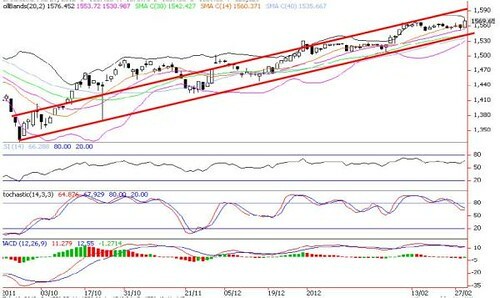 The KLCI is still below our envisaged resistance channels of 1570-1580 points. 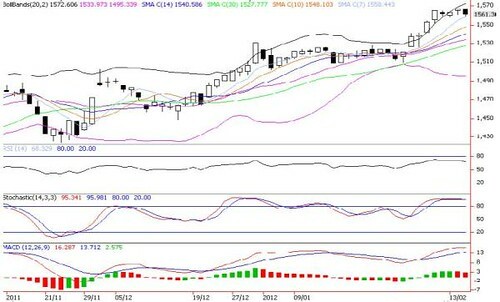 Supports fall on 14-d SMA (1554), 1550 and mid Bollinger band (1543). # In a filing to Bursa Malaysia, Maxis proposed to establish an Unrated Islamic MTN Programme with an aggregate value of up to RM2.45bn and tenure of 30 years from the date of first issue of the sukuk. 2. RM1 billion for CAPEX / working capital and other general purposes. 2. RM97 million for the 9 months ended 30 September 2011. # The tax credit in respect of prior years will be refunded over a period of 5 years commencing 2012. # The consolidated gearing will increase from 0.63x to 0.75x on proforma basis, based on 2010 audited accounts. # The tax benefit is perceived to be positive to Maxis relieving NGBB’s front-loaded high CAPEX and cost. After some channel checking, Maxis NGBB business is not "flying” as Maxis has only managed to secure about 4,000 subscribers to date. # Tax credit in respect of prior years is assumed to further reduce tax by RM44.6m for FY12-FY16. Government, regulatory, industry and execution risks. Updated forecast with above mentioned assumptions. As a result, EPS for FY11 to FY13 are revised upward by 8.8%, 4.1% and 1.2% respectively. New business potential in converged services, strong postpaid ARPUs and smartphone penetration. We upgraded our DD-derived Target Price by 2.8% to RM5.54 from RM5.39 with WACC of 7.5% and TG of 0%. The Dow Jones jumped 123 points or 1% to 3-year high at 12904, recouping 15 Feb’s 0.8% decline, amid positive economic data from weekly jobless claims, February Philadelphia manufacturing index and Jan builders permits, discounting Moody’s warning to put 17 global banks and 114 European financial institutions on review for possible downgrades. Sentiment also improved on unconfirmed report that the ECB is swapping its Greek bonds for new ones to ensure it is not forced to take losses in a debt restructuring. European governments are also considering cutting interest rates on emergency loans to Greece and using contributions from the ECB. Asian markets were in red amid news that Moody’s may cut the credit ratings of 17 global and 114 European financial institutions as the Eurozone government debt crisis is spreading throughout the global financial systems. Investors are also frustrated amid the deadlock in cementing a crucial bailout for stricken Greece. Tracking regional losses, KLCI tumbled 10.8 points to 1550.5, led by blue chips i.e. TENAGA (-13 sen to RM6.00), PBBANK (-12 sen to RM13.64), DIGI (-6 sen to RM4.10), SIME (-7 sen to RM9.54) and KLK (-58 sen to RM24.80). 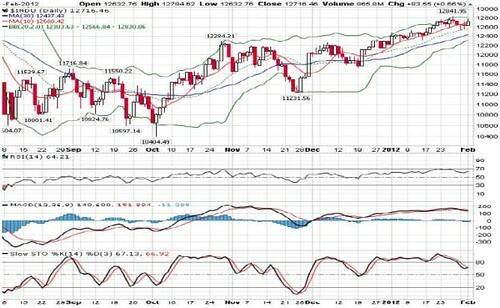 Immediate resistance levels are situated at 7-d SMA (1560), 15 February’s high of 1567 and upper Bollinger band (1574). 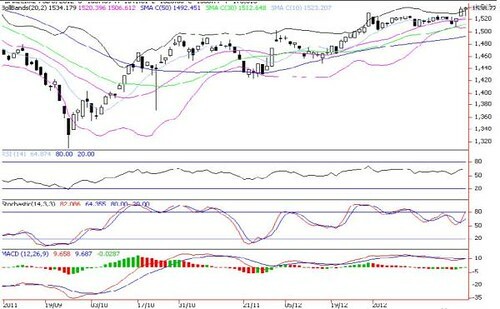 The Dow Jones inched up 21 points higher in the opening amid better-than-expected Feb home builders index and Empire state index reports, China’s commitment in buying Eurobonds and lower-than-expected decline in euro-zone economy. However, the gains were erased and the Dow Jones finally dropped 97 points after the FOMC’s minutes from its 24-25 January meeting showed only a few members of the policy-setting panel favored another round of quantitative easing while the decision slated for Greek’s €130 billion of aid was postponed again. Asian markets were higher, led by NIKKEI (2.3%), HSI (2.1%) and SENSEX (2%) as sentiment was boosted by hopes that Greece would deliver on a commitment to enact harsh reforms, the unexpected injection of ¥325bn by Bank of Japan to bolster growth coupled with China’s pledge to continue to invest in eurozone government debt. Bucking the regional uptrend, KCLI moderated 4.8 points to 1561.3 as blue chips remained in profit taking consolidation mode. In order to sustain current rally to our envisaged resistance targets of 1570-1580, the KLCI must maintain its posture above 1550 points for the next 2-3 days amid heavy deliveries (last week’s average daily volume of 3.7bn shares). 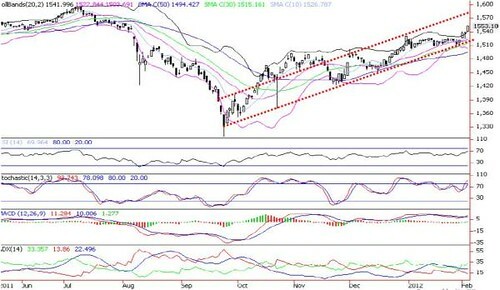 Following overnight Dow Jones’s fall, the KLCI is likely to continue its consolidation for a while. Immediate supports are 7-d SMA (1558), followed by 10-d SMA (1548). A breakdown below 10-d SMA would likely confirm a reversal and send the index back towards 1534 (mid Bollinger band) and 1527 (30-d SMA). Given the lack of U.S. economic data overnight, the Dow Jones inched 6 points higher to 12884 as investors continued to monitor developments in Greece, where talks on austerity reforms have been delayed several times this week. Meanwhile, Euro-area finance ministers are due to gather today in an emergency meeting in Brussels as the Greek government pushes to complete talks on terms of a rescue. AMMB prices tumbled from 52-wk high at RM7.18 on 6 January 2011 to a low of RM5.30 on 26 September 2011. Thereafter, it was trapped in range bound trade within the RM5.45-6.05 region. AMMB is consolidating upwards along the uptrend line formed since September 11 low. 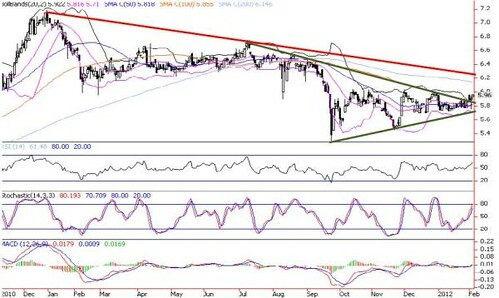 Following the triangle breakout, AMMB could test higher ground over the next few sessions with immediate resistance at RM6.15 (200-d SMA). A more bullish outlook would only appear if share price manages to close consistently above the 200-d SMA. 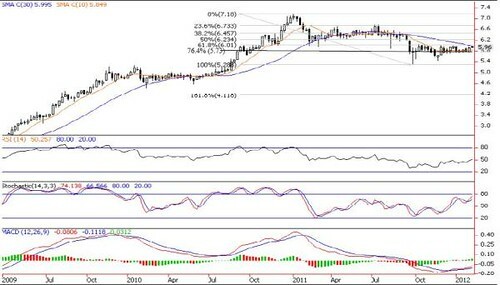 The next upside targets are RM6.23 (50% FR) and RM6.46 (38.2% FR). 5.86 (100-d SMA), RM5.82 (mid Bollinger band) and RM5.71 (lower Bollinger band). Cut loss below RM5.71. Asian bourses hit their highest levels in more than five months as investors kept alive hopes for an agreement of a new Greek bailout package despite further delays. Sentiment was also boosted on speculation of slowing inflation report today will provide more leeway for the China central bank to ease monetary policy. Top gainers were SHCOMP (2.4%), followed by TWSE (2.1%) and HSI (1.5%). Tracking the bullish regional tone, KLCI surged 14.4 points or 0.9% to 1553.2, supported by a 54% surge in daily volume to 4.4bn shares valued at RM3.3 billion. Renewed buying interest on index-linked stocks after recent consolidation and persistent active retail participation on lower liners, ACE and penny stocks are expected to sustain KLCI rally in the short term, in anticipation of positive progress on Greece debt talk, acceleration in ETP projects rollout, continuous funds inflows and stronger global manufacturing data. Immediate supports are 1542 (upper Bollinger band) and 1530 (31 Dec 11) whilst resistance levels are the upper channel near 1570-1580 zones. The SHCOMP tumbled 1.7% yesterday to lead most major Asian markets down as investors were disappointed by lack of monetary policy easing. Sentiment was also bruised amid slow progress in Greek debt talks. Last Friday, KLCI inched up 1.7 points to end at 1538.9 ahead of the extended long holidays on 6 & 7 Feb for the Birthday of Prophet Muhammad and Thaipusam. WoW, KLCI rose 17.9 points or 1.2% wow to stage a bullish breakout to a fresh 7-month high. 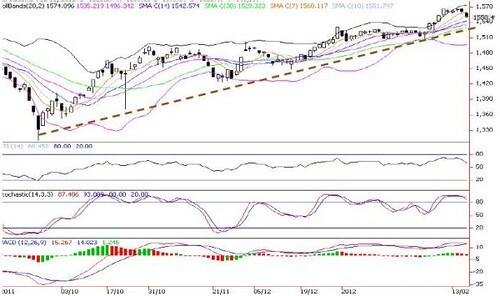 As KLCI continued to stay decisively above major SMAs support levels, it is poised to unfold a follow-through rebound. Following last week’s rally that partially filled the large gap of 1,529-1,546 points, the index may continue its ascending trend today to retest immediate resistance target at 1550. 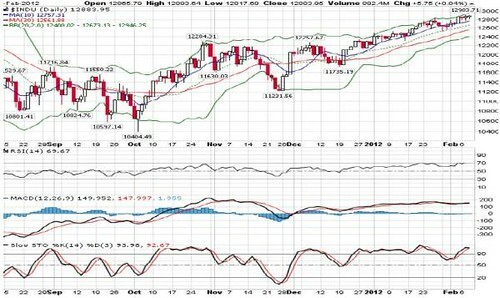 Immediate supports are 1530 (31 Dec 11), 10-d SMA (1523) and 1520 (mid Bollinger band). The Dow Jones was locked in a range bound trading band before moderating 11 points at 12705, ahead of the crucial January nonfarm payrolls data tonight. Despite lower weekly jobless claims and strengthening manufacturing data lately, sentiment was muted as investors digested a cautious economic outlook from the Fed that the economy recovery is frustratingly slow and vulnerable to shocks. The comments raised speculation that the Fed is willing to take additional steps to support the economy if conditions deteriorate. Led by HSII (+2%), SHCOMP (+2%) and TWSE (+1.4%), Asian markets were powered by commodity and financial stocks amid improvement in U.S., European and China manufacturing data. In line with regional bourses, KLCI rose15.8 points to 1537.1 as acceleration in ETP projects rollout lately and encouraging manufacturing data soothed fears about the global economic fallout from the euro zone debt crisis. Global equities are reacting positively to resilient activity in China, signs of stabilization in Europe, and the ongoing recovery in the U.S. Fresh excitement could also be in store for Asian equities following Fed’s decision on 25 Jan to keep the fed rate at exceptionally low till late 2014, which will encourage more carry trades to invest in overseas financial markets that offer potentially higher returns, particularly in Asia. With the index staging a strong breakout above 1530 (31 December 11 closing) and upper Bollinger band (1532), a challenge of the 1550 zones is back on the radar. 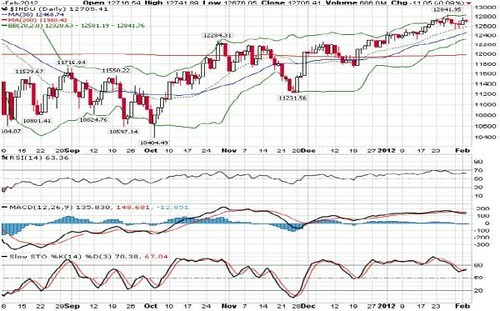 Immediate supports are 1531, 1519 (mid Bollinger band) and 1506 (lower Bollinger band). During the recent banking stocks correction, CIMB was one of the hardest hit bank stock (FIG# 4) as it tumbled to as low as RM6.56 (26 September 11) and consolidating within the RM6.60-7.50 band before closing at RM6.93 yesterday. 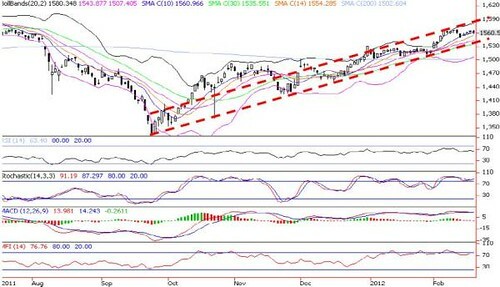 Currently, the momentum and trend indicators are grossly oversold (FIG#3) and are showing signs of bottoming up. Hence, the stock could test higher ground over the next few sessions to RM7.04 (540-d SMA) and RM7.12 (middle Bollinger band). Nevertheless, a more bullish outlook would only appear if share price manages to close consistently above RM7.12. 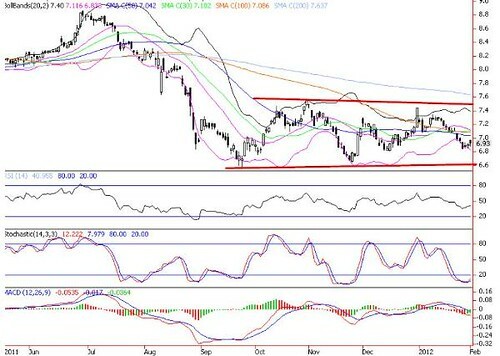 The next upside targets are RM7.40 (upper Bollinger band) and RM7.64 (200-d SMA) levels. 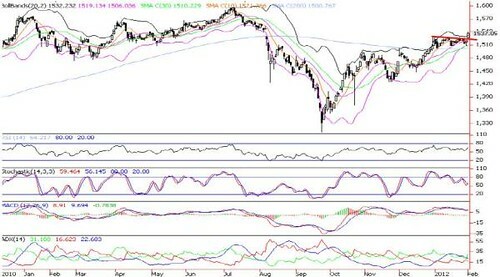 Immediate supports are RM6.83 (lower Bollinger band), RM6.64 (24 November 11 low) and RM6.56. Cut loss below RM6.64. # Reuters reported that India’s Supreme Court has ordered the government to revoke 122 telecoms licenses issued under a scandal tainted 2008 sale. # Idea Cellular’s (which Axiata has 19.7% stake) 13 licenses will be revoked along with competitors’ including Unitech Wireless (22 licenses), Loop Telecom (21 licenses), Videocon Telecommunications (21 licenses), Estisalat DB Telecom (15 licenses), S Tel (6 licenses), Sistema Shyam Teleservices (21 licenses) and Tata Teleservices (3 licenses). # These licenses were issued in 2008 under the influence of bribery and violation of rules. As a result, cost the government as much as US$36b in lost revenue. # On the bright side, Idea may be allowed to continue operation for the next 4 months, until regulators come out with new market rules or new auctions are conducted. # Idea claimed that the decision may reduce up to 4% of revenue. Pending further clarification from Axiata. # This news will definitely have a negative impact Axiata’s investment in India pending India government’s decision going forward. players may take part and elevate the cost of the scarce spectrum. 1. Illegal mutual roaming agreements to provide seamless nationwide 3G services. 2. Under reporting revenue to the government between 2006 and 2008. It was reported that Idea is fined US$24m. - Higher smartphone penetration boosting data ARPU. - Strong growth in low penetration developing markets. - More cost savings from collaboration with DiGi. Regulatory risks, FOREX fluctuations & competitive risks. – Despite the challenging 3Q11, Axiata’s main businesses (Celcom, XL, Dialog) continue to execute well. – Exposure to Indian telecom market which is currently under close scrutiny by the government. We reiterate our HOLD call with unchanged target price of RM4.92. We opine that the robust growth story may have come to an end especially for Celcom and XL who are the main contributors as market matures and competition intensifies. Wall Street snapped a four-day decline amid signs that manufacturing data across the world i.e. U.S. China, Germany and U.K are strengthening. Sentiment was also lifted by the highly anticipated Facebook IPO filing which could signal a rebound in capital markets activity. The Dow Jones jumped 84 points, but closed off the highs of +152 points. Asian bourses were mixed, following news on weaker US Jan Chicago PMI and consumer confidence reports. Manufacturing data from China showing manufacturing activity improved slightly in January, while a separate study by HSBC showed a continued contraction, albeit at a slower pace. This led to expectations Beijing may not immediately ease its monetary policy. On 31 January, KLCI index jumped 7.7 points, spurred by gains in GENTING (+22 sen to RM11.12), GENM (+16 sen to RM4.04), PETGAS (+48 sen to RM15.68), MAXIS (+15 sen to RM5.71) and SIME (+5 sen to RM9.14). The gains were driven by positive progress in Greece debt talks coupled with accelerations in ETP projects rollout lately. The positive equities markets from Europe and Wall St are likely to inject optimism to Asia markets and Bursa Malaysia today. Sentiment will also be supported by anticipation of accelerations in ETP projects rollout in the coming months. 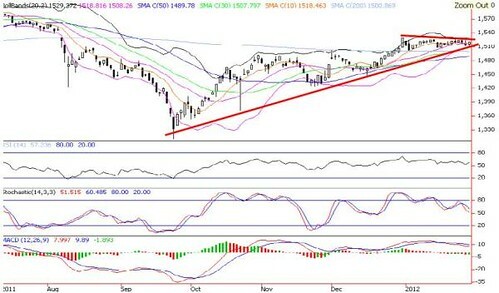 With the bulls and the bears still involved in a tug-of-war, the stalemate could drag on for a little longer unless KLCI is able to stage a breakout above 1531 (31 December 11 high). 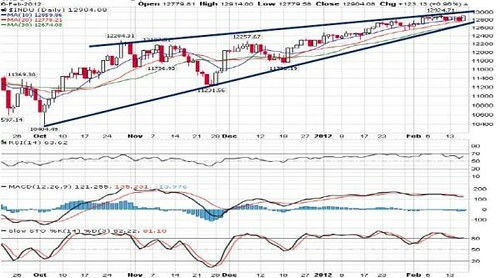 Immediate support is 1500 while resistance levels are the huge gap between 1529-1546 (5 August 11). 4Q11 net profit of RM877m (-2.4% qoq; +3.6% yoy) took FY11 net profit to RM3,483.8m (+14.3% yoy) which was in line with our (103.9%) and street (101.5%) forecasts. 2nd interim of 28 sen single tier dividend. Ex and payment dates are 15 and 27 Feb. Total net dividend and payout ratio of 48 sen and 48.3% is in line with our projection of 48.8 sen and company’s policy of circa 50% (unchanged). operations (only 7%) while domestic growth was 14.1%. # Besides loans growth, earnings expansion in FY11 was due to decent non-interest income growth, contained rise in overheads and lower provisions. # For FY12, it is targeting 12-13% loans and deposits growth (vs. HLIB’s projection of 11%) that is expected to more than offset the anticipated 10-15bps erosion in NIM. # Asset quality continued to improve and remained stable. Guidance is for both asset quality and credit charge to stay stable with boost from full adoption of FRS139. # It is able to meet Basel III requirements ahead of time while existing capitals were grandfathered. Upon further clarifications, it strives to continue maintain a lean capital structure. BNM’s concept paper on counter-cyclical capital buffer is expected by 2014. Unexpected jump in impaired loans and lower than expected loan growth. FY12-13 forecasts raised by 1.4-1.9% following final results while we introduced FY14 forecast. - Excellent track record in delivering guidance and consistency in growth. - Dividend payout lower than previous years and uncertainty about quantum of counter cyclical buffer. RM13.90 (vs. RM13.45) post final results fine-tuning, based on Gordon Growth with ROE of 24.3% and WACC of 9.6%.